I was lucky enough to meet up and play a few games for a couple of hours with our forum's very own Danisthirty on Saturday. 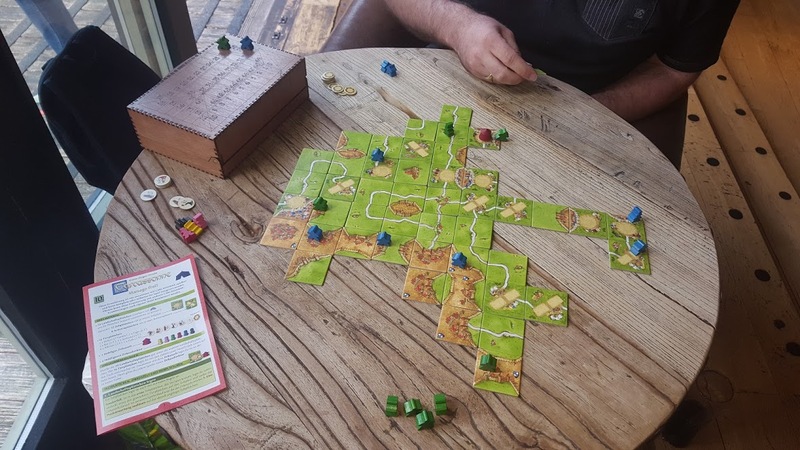 We found the time to coordinate our very crazy schedules and met in Thirsty Meeple (Oxford). 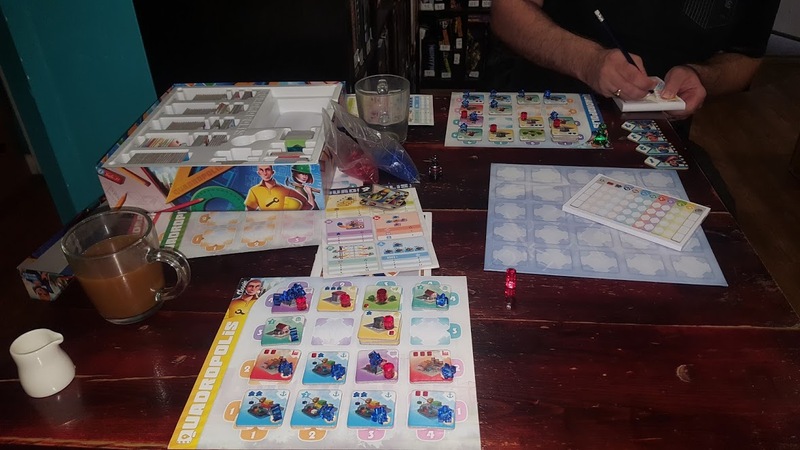 We had no time to lose, so started with Quadropolis. I think what I liked about this game, is I managed to set it up in only a few minutes with only the rule book as a guide. Dan arrived just in time and explained what was required. I'll probably have to write up my thoughts some other time. But it's similar to 'Between Two Cities' except you're not and you have no one but yourself to blame for you bad choices. The set collecting elements seem better balanced in my opinion and the tile drafting was delightful. 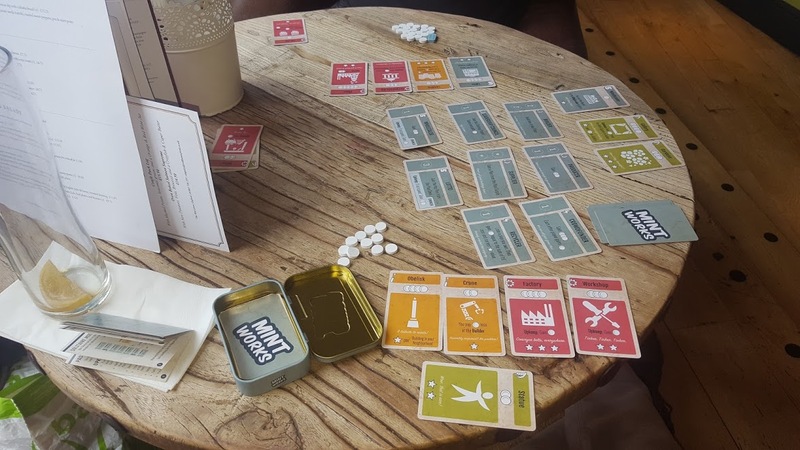 The game is split over 4 rounds (we played basic), and I distinctly enjoyed how the game tidied itself away and easy to set out for the next game. I always enjoy min-max-ing point scoring opportunities; this game has plenty. I'm glad Dan took the time to explain the game to me and he went very easy on me considering how well he knows it. Thankfully my industrial powerhouse scored some vital points and I won the game! What Dan didn't realise was, he only lost because his entire city was up-side down! 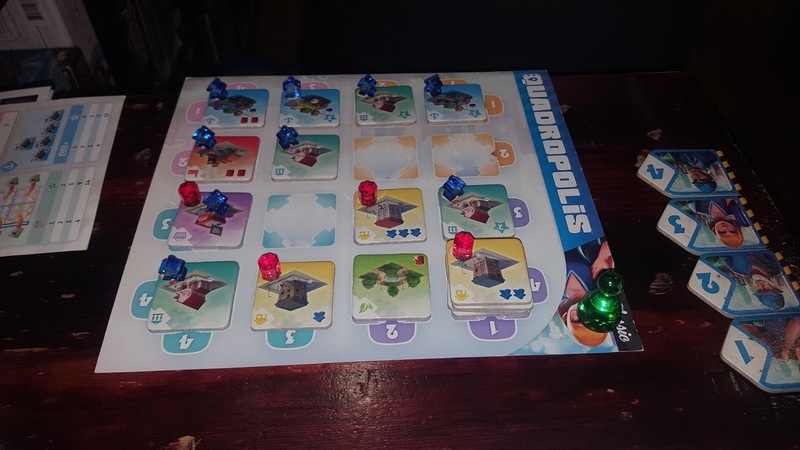 I late came back to buy Quadropolis, I really enjoyed it! Next up was a new game for both of us. I've heard so many things about 'Clank! '; which is a game you have to end sentences with in order to avoid confusion. The kind gentlemen at ThirstyMeeple explained the rules and we were off, dungeon crawling and deck building. I had mixed opinions about it, it's definitely fun; I liked the pacing. 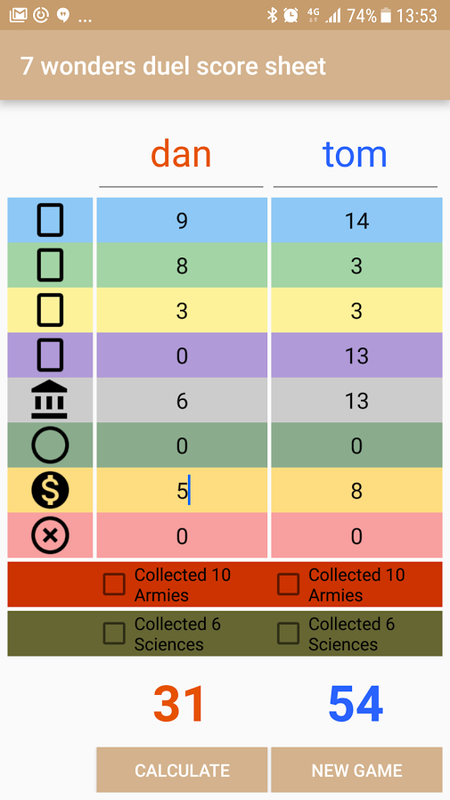 We messed up quite a few rules, but overall I think the Deck was too big causing too much variance. We found the Dragon was mainly inactive; though this may have been because we didn't move it having picked up an artefact (one missed rule). We also didn't do much clanking; so never really felt threatened. As with most deck builders, having a tight deck usually means you have predictable movements or actions, but I seemed to get predictability with a bloated deck too. I really liked the lightweight dungeon crawl and most of the theme. I also enjoyed the self-made pacing and the rush for the exit once acquiring enough artefacts. It's out of print pretty much everywhere, so I'll have to sit patiently and decide if I want to buy it or not. Although Dan was the first out of the dungeon, my final turn allowed me to buy the card that gave me 10 points which neither of us understood until after Dan had left; I think that was enough to swing it in Dan's favour, but we all know it's because Dan's cards were upside down. 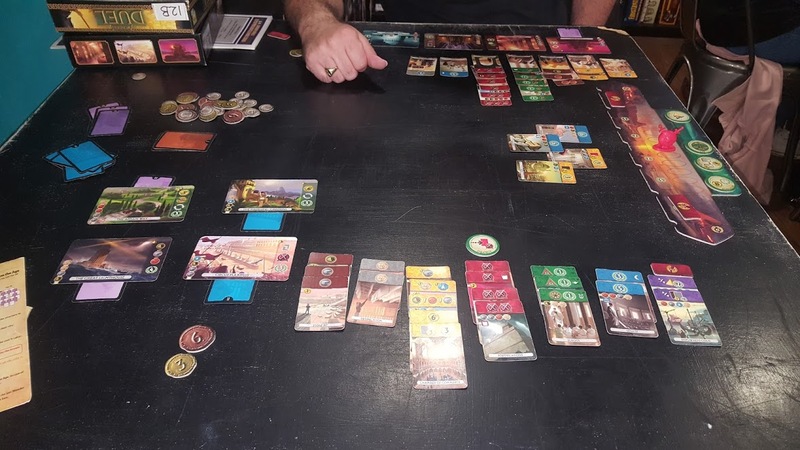 We had about 20 minutes left until Thirsty Meeple had to kick us out....we needed a short game we both knew... 7 Wonders Duel! It was time for some lunch - I have to say that that felt like the shortest 3-hours of boardgaming I've ever had! We found a pub to have lunch - I had a home-made burger, which was odd because why is someone making burgers at home then bringing them to work; what's wrong with the kitchen there? After finishing lunch, I pulled out: Mint Works. 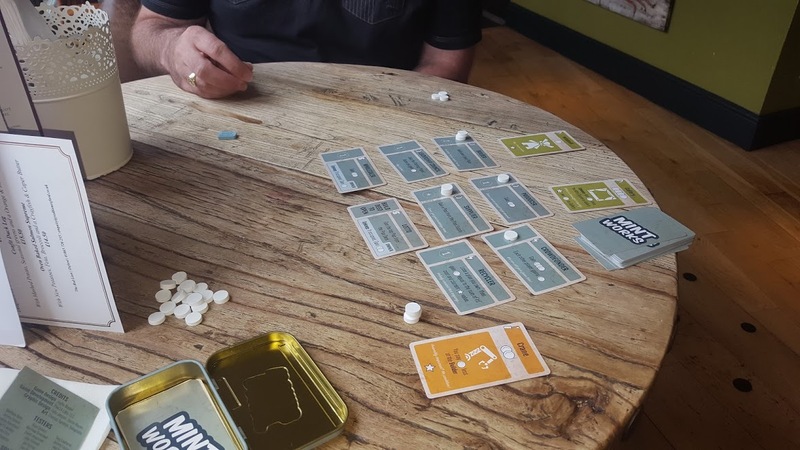 It was safe to say that the rules for Mint Works are simple; but the rule book for Mint Works managed to obfuscate something which should fill a page, into something that filled 6 pages but then someone felt needed to be crammed into a Mint Tin. The rules are a disaster! 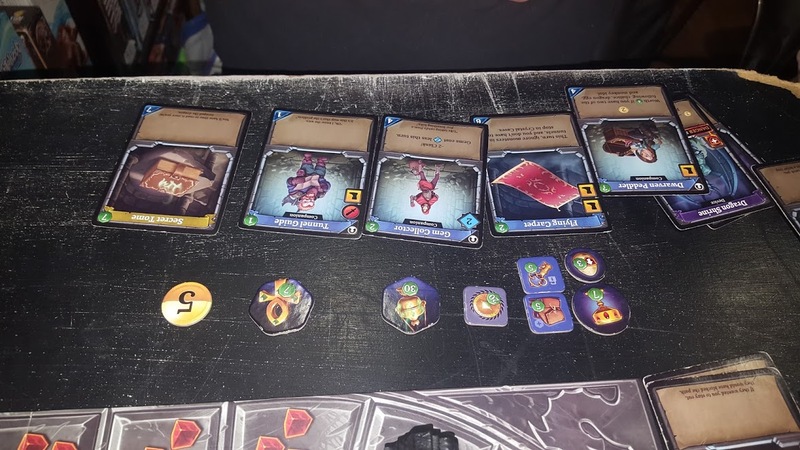 First game we abandoned, the second game we got a bit closer and the third game we understood but no one explained that the deed buildings need their plan in order to build. 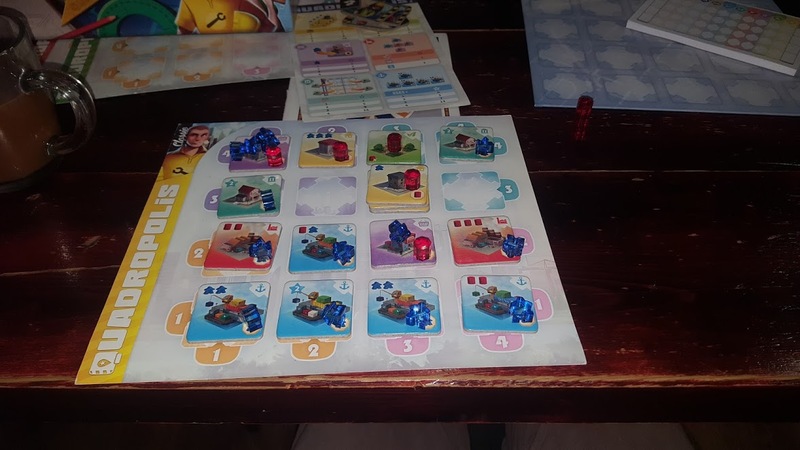 I managed to force a victory in our final game by building 2 3 star buildings...but again really the problem was that Dan's city was upside down. Other than the rules being terrible, the only other complaint how the end game is scored.If there are only 2 opportunities to build, if one player forces the end game, the 2nd player must beat them in the final action. We decided to say: 3-mints = 1Star and then the game was won by Dan and it seemed like a good thing to do given he could build no more that turn. 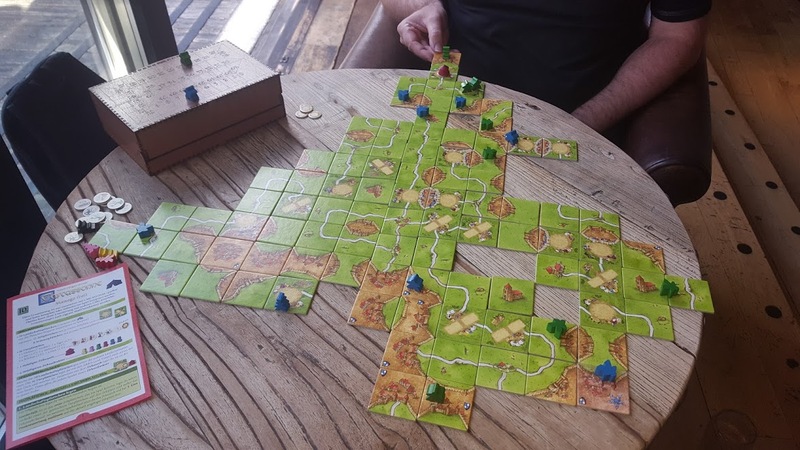 It's almost always customary to play Carcassonne when we get the opportunity and so Dan and I got to play the latest Expansion of 'Manege Frei' (aka: Manky Fries). As most of you know I'm not one to complain about artwork, but I did feel the circus tiles didn't blend into their background or the landscape very well; dimensionally it didn't sit right with me, the perspective wasn't right. This is an interesting expansion, all about clustering elements and keeping tempo. 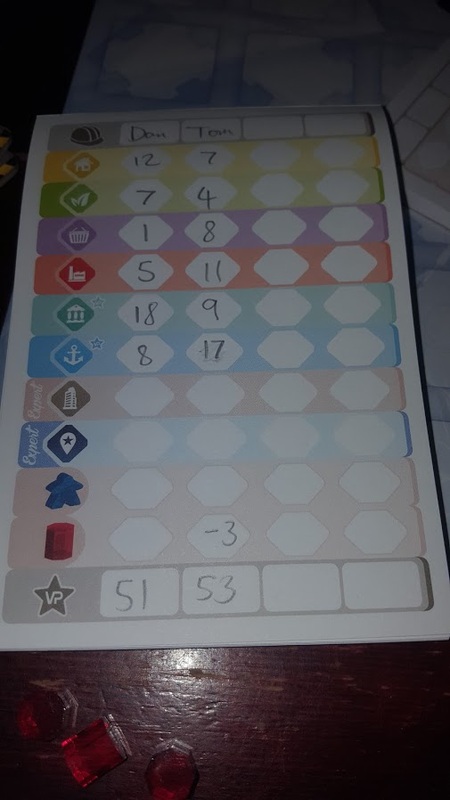 Ring Masters score for being close to circus tiles; while Big Tops mean you have to keep meeple active for longer to score some large multipliers. The Acrobats I've discussed on Whaleyland's post; there's some interesting strategy, but trapping meeple seems like a good use. The large number of tiles leaves for some big scores, cloisters were almost irrelevant in our game. After a big farm battle, I managed to trap my last 2 meeple on a pyramid tile because I didn't have a third to escape it. However, I was able to place the last BigTop tile to get a hefty multiplier, making up for the lost farm. The Big Top had a 3 under it which allowed me to recover, ultimately we both scored 209 points! We ended the day nipping for a curry! Big Thanks to Dan for taking the time to play a load of games with me! 5 games in as many hours isn't bad, in my book and all in all very successful. Looking forward to the next opportunity. Thanks for the write-up Tom, and for your company for the day yesterday. 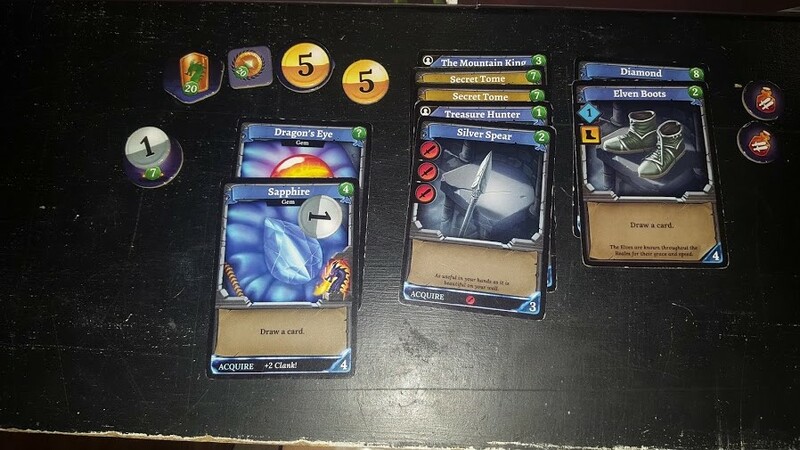 Not a lot I can add to this other than that I definitely felt like I earned the moral victory in Clank! for ignoring a card which I didn't understand rather than actually finding out what it meant in the rulebook, realising that it was very valuable and consequently buying it as Tom did. Mint Works was awesome! Tom was even kind enough to give me his copy of the game as he had the foresight to buy two when he backed it on KickStarter. I've since played it three times with Becky and it's sure to be played again soon. And it all fits in a mint tin: amazing! 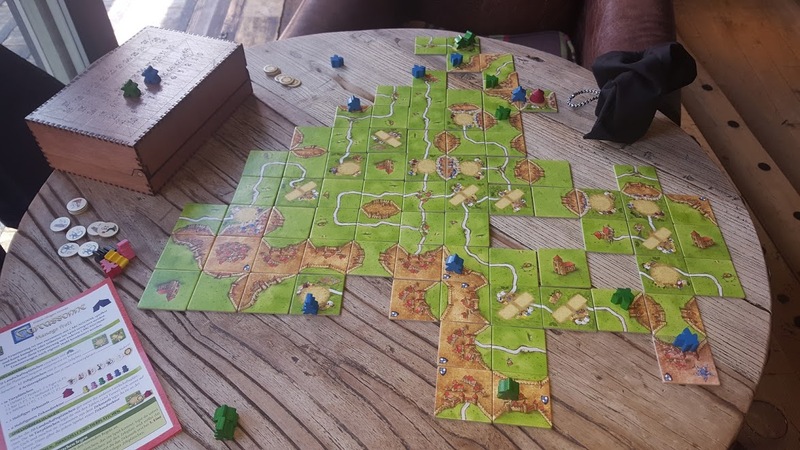 Our final game of the day was Carcassonne + thingamydoodlebugexpansion10whatsitcalledsomethingtodowithcircuses? which was a lot of fun. Neither of us were taking it especially seriously but wanted to experience the new expansion and so probably took a few more risks than we might have done if we were playing more competitively. I turned down the opportunity to trap 2 of Tom's meeples as acrobats at one point, which might have helped me later on, but it didn't feel like it was in the spirit of the game so I played elsewhere and let him get them back when he could. Ultimately though, the new additions changed the game in positive ways and I was pleasantly surprised by the game (and especially that it was a draw). PS - Parking at the park and ride was definitely the way forward - £2 to park for the day rather than about £26 or whatever it was last time we went to Thirsty Meeples. It did mean getting the bus into Oxford and back (another £2.60) which was mostly fine, but a little challenging finding where to catch the bus from to get back to the car park afterwards as I'm utterly hopeless with buses. Looks like you guys had an enjoyable day - let me know next time you're heading there as I'd be happy to meet up if I'm free (and you don't mind) and was only thinking earlier today that I should visit again soon. 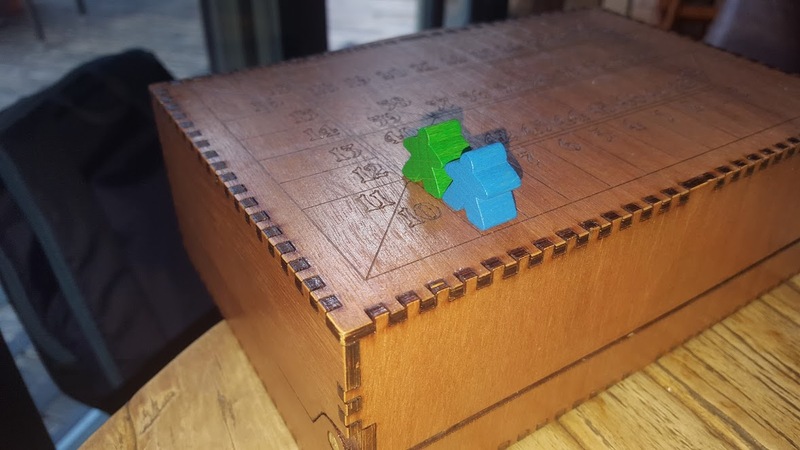 I went to The Dice Cup on Sunday with the boys, where we had an enjoyable 4 hours or so playing lots of games. We started off with Diamonds which is a relatively new game to us (which incidentally I ordered from Thirsty Meeples last night). I lost miserably despite the boys focusing on battling between themselves to steal each others diamonds! This was followed by Love Letter which the boys like, although we didn't realise this version had a promo with 2 extra cards (princess with glasses and prince) which meant the first round had to be abandoned as there was a tie for first place with two 8 cards! Once we'd checked the deck, the game progressed pretty quickly and I was rather fortunate to guess Luke's card at the first attempt on 3 consecutive rounds much to his displeasure. I did get Jacob too, so I didn't feel that I was just picking on the youngest! I had played Hanabi once and was keen to play again and introduce it to the boys. They weren't so keen initially, but soon got into the swing of it. We did pretty reasonably, and managed 22 (out of 25) points without cheating. Think I'll be buying this little filler shortly - it's already in the Amazon basket. Next up was the obligatory game of Ice Cool. I'm not really a fan of this tbh, but they're both really keen having played it at the UK Games Expo last year. I don't mind playing it whilst we're out, as it means the boys won't nag me to buy a copy for home. Luke seemed to struggle a bit as he kept hurting his finger trying to flick the penguin really hard. On the whole it was pretty even with collecting the fish and avoiding getting caught / losing your ID, but I was lucky getting high value cards and ended up the winner for a rare change at this game. Clank! followed, which Luke and I have played once at a friends house. He seemed to remember most of the rules, whilst I kept referring to the instructions about what to do next. Both the boys played well and managed to get lots of loot (including the bag so they could carry an extra artifact). Things were pretty even for a while, although I probably had the least points most of the time. Just to make things worse, I somehow kept using clank, so when the dragon kept appearing nearer the end, sure enough it was me who kept losing health. I ended up dying beneath ground just as I had turned round to start my way out, whilst they carried on and managed to escape with their goodies. Luke won quite handsomely, although Jacob had been scoring well in the last few hands. Before we could leave, they both wanted to play Truro. Jacob and I managed to fall off the board in both games, leaving Luke as the winner both times. The first game was pretty close, as I lasted until the final tile but I couldn't play it without sending myself off the edge. All in all it was a throughly enjoyable trip out and there are a few games we're going to learn how to play ready for next time. PS Hope you don't mind me posting this here, it's turned out to be a bit of a long response! You're always very welcome to post here Rich! It sounds like you had a very busy weekend gaming too - it also looks like you managed to get a lot more done in 4 hours than we did in 3! What did you think of Clank!? I imagine that dying early on can make it a tad boring. I've not played Hanabi, but have seen a few games and a score of 22 is mighty impressive; especially if it was your boys' first game! I read somewhere that the game is 'completable' meaning it can be solved-perfectly from any start position; which seems like a pretty amazing property. 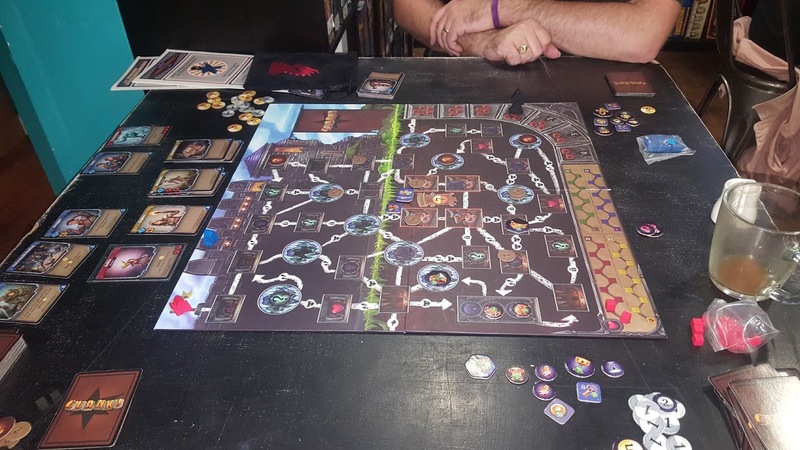 I quite enjoy Clank! but am not very good at creating a good deck. Hopefully that will come with time though, once I'm more familiar with the cards. I was pleased they had a copy in their library, especially as it's rather difficult to get hold of at the moment. We generally like to play quite a few games, so tend to go for fillers or relatively light games. The next few to investigate are Red 7 and The Game of Trains. Good find! I've been looking since I got home and haven't been able to find a copy, I may have to let this one slip me by! Talking of games which are tricky to get hold of, Ghostel is on my list to play - hopefully get chance at UKGE in few weeks. Probably pick up Santorini there too if someone's selling it. The designer of Ghostel is a local Cardiffian - I've not spoken to him, but he did have a stall at the International Tabletop Day I went to recently. If you would like a copy I can look to find you one! That might be handy (thanks), but would like to play it first. Not seen any reviews from the big names yet (can't seem to find any videos), although I've heard The Dice Tower are due be review it this week. I've bought 3 games this week and another last week (spending my birthday money and getting stuff for Luke), so will need to be careful buying more games for a while so definitely only getting those we really enjoy.